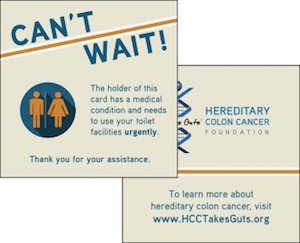 Through education and personal assistance we serve families at risk of cancer due to hereditary colon cancer syndromes. We strive to ensure they receive preventative, life saving medical care. Did you know that with early diagnosis, cancer risk in these families can be reduced from nearly 100% down to 0%?! When YOU donate…we raise awareness…early diagnosis occurs…lives are saved! Every $5 donation allows us to support 1 family through personal assistance and education! Fist Bump Sponsor: I am so pleased to support 5 families! High Five Sponsor: I can lend a hand to support 10 families! Bronze Sponsor: I appreciate the Foundation and will support 20 families! Silver Sponsor: I believe whole-heartedly in this cause and will support 50 families! Gold Sponsor: I want to make a huge impact and support 100 families! Platinum Sponsor: This. Is. Personal. I WILL support this community! Cards read: "The holder of this card has a medical condition and needs to use your toilet facilities urgently. Thank you for your assistance." Request a maximum of 3 cards/tattoos for every $10 donation. Request a maximum of 5 tattoos for every $10 donation. 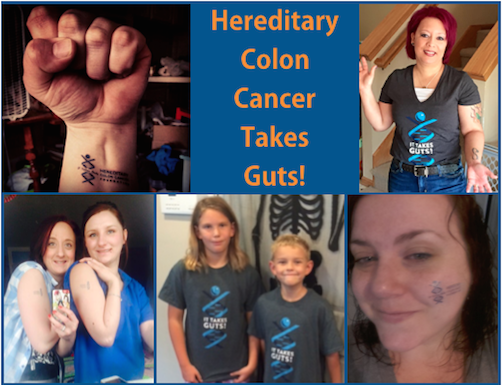 Donate 100% - Add 3% so that 100% of the donation goes to Hereditary Colon Cancer Foundation. 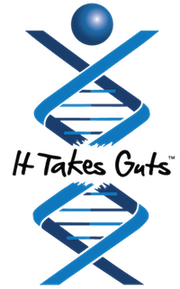 Hereditary Colon Cancer Foundation has partnered with Network for Good to securely process your online credit card payment via Network for Good (tax ID 68-0480736). This transaction will appear on your credit card statement as "Network for Good." This transaction is subject to Network for Good’s Privacy, Security & Disclosure Statement and the Charitable Solicitation Disclosure.